BUY TODAY! A handmade replica and GET FREE SHIPPING all over Greece! The so-called "Constantinato" has Byzantine origin, it is either gold-plated or silver, and it is said by our people to be miraculous. Get yours now in silver 925° or in gold-plated silver with 24 carats, to hide it into the New Years cake, the famous "Vassilopita" or offer it as a gift to newlyweds, to a mother in labour or a newborn baby ... to bring them luck! This "Constantinato" lucky coin is crafted by hand, casted in silver 925° and plated with 24 carats gold. You can also look at the "Constantinato", made of silver 925°! Also, see our collection of charms. Order now yours or offer it as a unique gift. The Constantinata lucky coins, or commonly Constantinata, are mainly Byzantine gold coins, which were probably minted during reign of Constantine the Great. The coins' depiction is similar to a hagiography, depicting St. Constantine and St. Helena, with the Holy Cross between them. The Constantinato coin is also called Agioconstantinato and Aiselinato. The historical origin of the Constantinato is closely associated with the depicted Saints in the currency and the discovery of the Holy Cross by Saint Helena. According to tradition, when St. Helena found the Holy Cross buried in Jerusalem, in 326 AD, she cut it in two parts, one of which she left in Jerusalem, while the other was carried to Constantinople (Istanbul). The sawdust of the Holy Cross was mixed with other precious metals, in order to create the alloy of the first minted Constantinata coins. 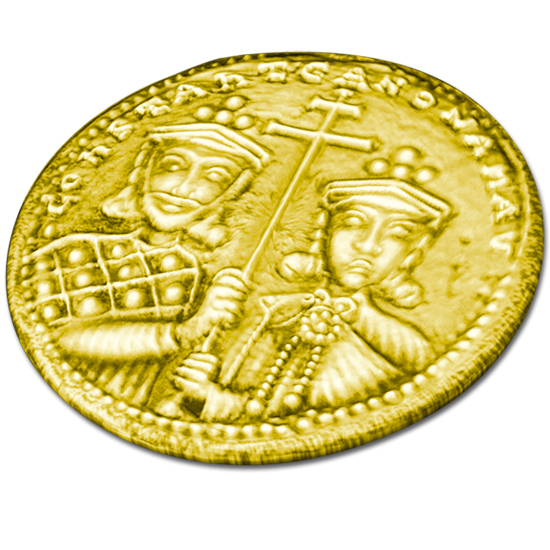 Many folk traditions, developed mainly during the Byzantine period, speculate that the coin has miraculous powers. More specifically, pregnant women wore Constantinata, in order to protect the baby and to ease childbirth. They also hanged gold constantinata coins, as amulets, on the child's neck, to protect them against the "evil eye". According to this tradition, even today we offer gold coins as gifts or christenings to children and infants, during their birth or their baptism. Likewise, it is given as a gift to newlywed couples. Also, during the Greek War of Independence in 1821, many Greek heroes wore Constantinata coins as talismans, in order to protect themselves. Among other traditions, it is believed that the Constantinata could cure high fever, epilepsy and jaundice, and that they accelerated the production of flour and yogurt. Byzantine coins kept at the Numismatic Museum in Athens and the Museum of Byzantine Culture in Thessaloniki.